New features to this edition: Online Access Card included in the book and Section 1 has been revised. This edition also takes into consideration the fact that the GAMSAT no longer permits calculators and so the steps of all calculations are shown. No science background in university? Great in the sciences but little experience reading from the humanities or writing essays? Had a bad experience with a high school physics teacher? Full time arts student? Full time mom? Part time job? It's OK. The Gold Standard has you covered. This is not just a textbook, it is a learning experience. The Gold Standard has integrated textbook reading with many free features including online problem solving with explanations, essays for you to review in the book and online, 10 hours of online teaching videos with ideas presented in clear terms, online equation lists and organic reaction summary, hundreds of additional practice questions with a forum thread to discuss every individual question - for free - and much more. 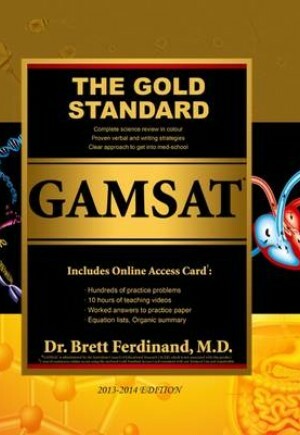 We also offer the Gold Standard GAMSAT DVD with helpful strategies for all test sections; 16 science review DVDs prepared for the MCAT and, thankfully, contain all the major GAMSAT science topics clearly explained; and to increase study efficiency: flashcards, MP3s and an iPhone application. The flashcards and iPhone App point to which section in the book you can find more details. The book points to which DVD you can use as a lecture. The videos and the explanations to the practice tests also point to specific sections of the book should you require clarification. A multimedia integrated approach so you can choose the tools that help you study best. The Gold Standard GAMSAT textbook stands at the center.